ITALIE – Riace - Archaeologists are investigating the discovery of a gilded bronze lion found off the coast of Calabria not far from where the famed Riace Bronzes were discovered 40 years ago. Armour in bronze and copper was also found by a diver and two tourists in the area that is now closed to the public as investigators probe the details of the find. One of the divers who made the discovery said there may be a ship and other important artifacts there as well. "When I went into the water, I saw a statue that was stuck between the rocks and a piece of the ship," explained Bruno Bruzzaniti. "The tides, however, cover everything and then you must be really fortunate to be able to see other items that are still at the bottom of the sea." The discovery sounds similar to that of the iconic Riace Bronzes, 2,500-year-old statues representing ancient warriors which were discovered in 1972 by a Roman holidaymaker scuba diving off the Calabrian coast. That find turned out to be one of Italy's most important archaeological discoveries in the last 100 years. Those statues are of two virile men, presumably warriors or gods, who possibly held lances and shields at one time. At around two metres, they are larger than life. 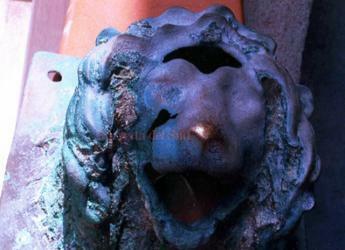 The newly discovered bronze lion is said to be about 50 centimetres high and weighs 15 kilograms. Also found in the area of the lion were remains of vases and other statues. An early hypothesis suggests that all these newly found items were aboard a ship that sank just off the Calabrian coast. 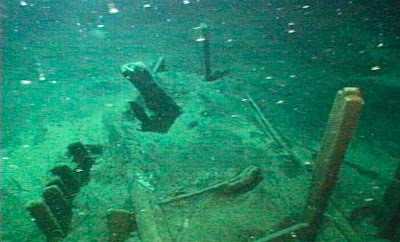 However, it's up to experts in the Cultural Heritage department to determine the precise age of the artifacts and piece together what happened that left the objects strewn around the sea bed. BANGLADESH – Pundranagar - When Abdus Sattar built his house in Mahasthangarh village in northern Bangladesh, he used materials that once laid the foundations of one of the world's oldest and greatest cities. Mahasthangarh sits on what was once the ancient city of Pundranagar, built 2,500 years ago and, at its height, a renowned seat of learning whose monasteries attracted monks from China and Tibet and trained them to spread Buddhist teachings across south and east Asia. 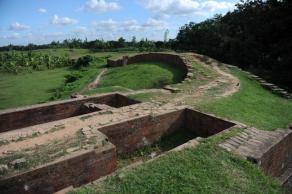 The oldest archaeological site in what is now Bangladesh, the ruins of the fortified city are a major tourist attraction, but experts fear there will soon be little left for visitors to see. The stripping away of sections of the ruins by residential encroachment and the casual looting of artifacts has threatened to erase the remains of a city that stood for millennia. In May, the Global Heritage Fund, which promotes the preservation of historic architectural treasures around the world, listed Mahasthangarh among Asia's top 10 most endangered sites facing "irreparable loss and destruction". After a Bangladesh court handed down an order against illegal squatters early this year, houses like Sattar's began to be demolished, but archaeologists say much of the damage already done is now irreversible. Antiquities found at the site suggest it was founded sometime in the 4th century BC and came to prominence during the great Mauryan dynasty that held sway over much of the Indian subcontinent until 185 BC. Its golden period stretched from the 4th to the 7th century when, as part of the Gupta and Pala kingdoms, it was one of the largest cities in the world and a major centre of Buddhist teaching and studies. The fortified area was still in use as late as the 18th century, but its influence had waned and it was eventually abandoned and consumed by the surrounding vegetation. The site was rediscovered in 1879 by British archaeologist Alexander Cunningham. CANADA – Pickering - About 20 students from the Toronto and Region Conservation Authority's (TRCA) Boyd Archaeological Field School were at the site of an historic Huron-Wendat village near Whitevale known as Sebastien on Aug. 20, conducting field work for the 17-day program. The site, which dates from 1275 to 1375, was discovered during surveys of the provincially owned Seaton lands and is now an archaeological preserve. A former farmer's field, the site is covered with goldenrod and bordered by forests, with little to tip off the untrained eye to the historical significance hidden just beneath the soil. 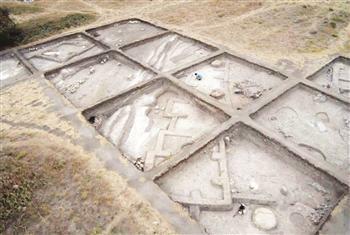 TURQUIE – Aktopraklık Mound - Houses dating back 5,550 years and other aspects of Turkey’s archaeological history will soon be opened at one of Turkey’s first Archeoparks in the northwestern province of Bursa’s Nilüfer district. Specialists have been working on the ancient sites of Miletepolis, Apollonia ad Ryndacum and Lapadion in preparation for the opening of the archeopark. Archaeologists have also been focusing their efforts on examining the Aktopraklık Mound, which dates back to between 6500 and 5500 B.C., making it one of the oldest villages in northwestern Anatolia. Scientists have extracted 15 structures so far and have created an exhibit out of four of them, according to Dr. Necmi Karul at the Prehistory Department of Istanbul University.